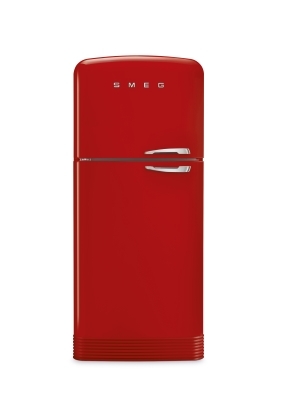 Celebrating 70 years of design and innovation, Smeg has released two new versions of one of its most iconic appliances. 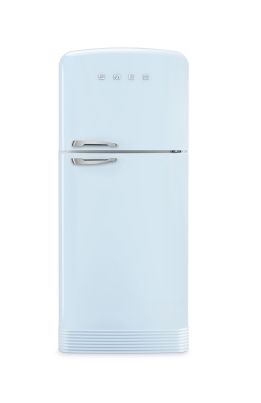 The brand’s family-sized FAB50 retro style refrigerator, originally conceived 21 years ago, has been released in two new colours – Pastel Blue and Red – due to popular demand. Just like the FAB50’s original colours – panna, white and black – the new colours are perfect matches for the brand’s retro small appliances that have become worldwide style icons. The FAB50, with a gross capacity of 467 litres, is a two-door frost-free refrigerator/freezer, featuring two chiller compartments, adjustable quick-chill crystal glass shelves and two fruit/vegetable compartments, while the freezer has a manual icemaker and a fast-freeze compartment.